In the last post, I warned against THR-vs-THR sniping, in which aficionados — or more likely merchants — of one THR product denigrate other good THR products. 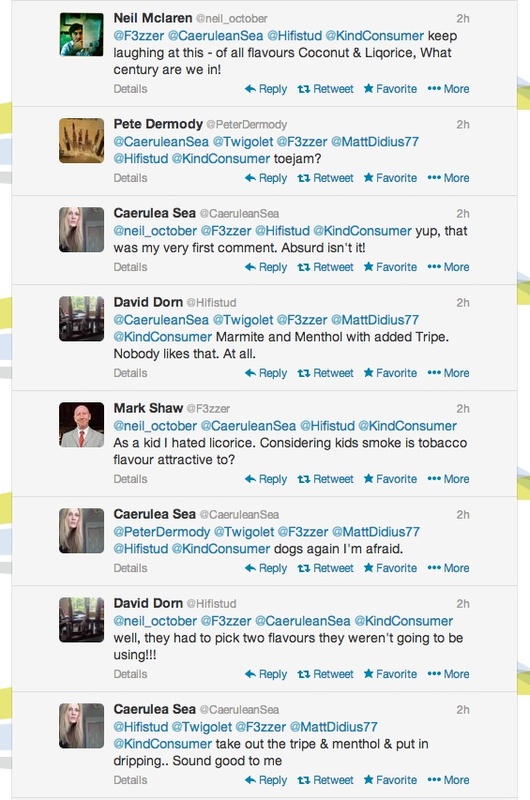 Since posting that, I observed various know-nothing remarks about smokeless tobacco by e-cigarette users (many in response to a CASAA tweet about smokeless). Perhaps it was no more than usual, but I was primed to notice them. 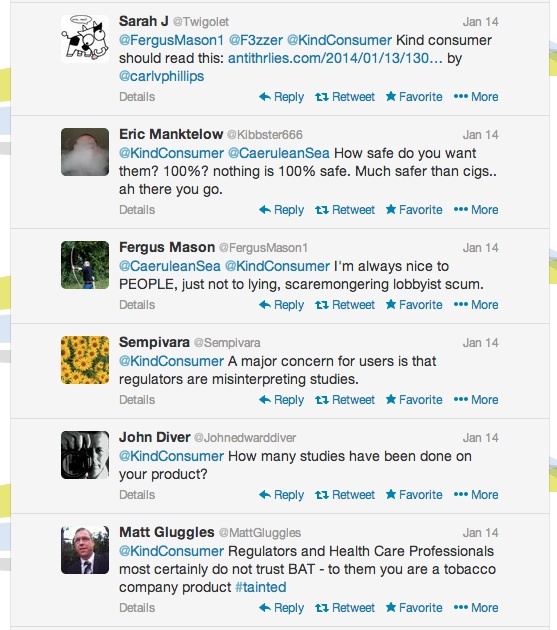 Honest ignorance (and that is what that almost always is at the consumer level) can be cured. Not-so-honest non-ignorant marketing ploys are a different story. 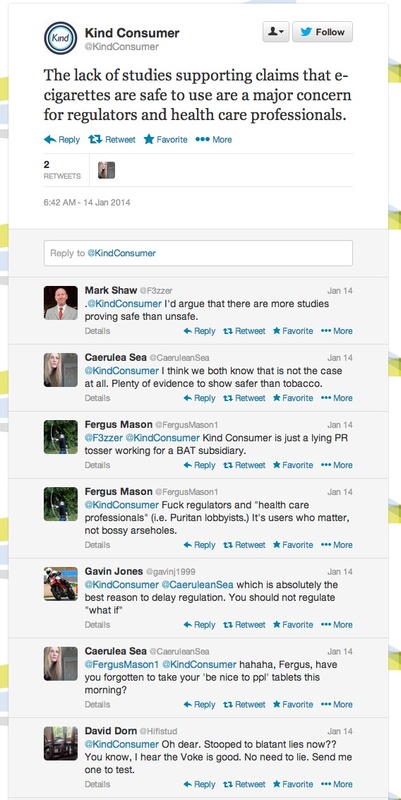 As if to prove my point, the day after my post Kind Consumer (who clearly does not take the time to read this blog) launched an anti-ecig propaganda campaign. 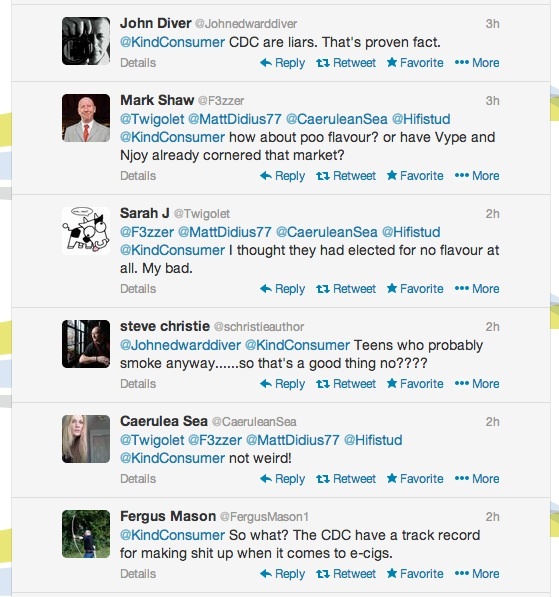 For those who do not know, Kind Consumer is the company that developed the non-electronic e-cigarette variation that BAT purchased the rights to and plans to sell with medicines approval (that is, it will be approved by the UK’s MHRA as a substitute for smoking; note that FDA and other similar regulators do not have such a designation). The current trade name for the product (to explain the reference in the threads reprinted below) is Voke. As far as I can tell, this is the only marketable product that Kind Consumer has, so the suggestions in those threads that BAT should be blamed for this propaganda do have an element of fairness (even though they already sell a current-generation e-cigarette, trade name Vype). And, yes, I referred to the non-electronic Voke as an “e-cigarette”. I think it is a safe bet that the widely-accepted name will stick for new variants that are not actually “e”. So the joke is kind of on them. Sorry for the multiple-chop and not-quite-aligned-paste, but I am trying to get the highlights (and am dealing with the limits of my graphics skills). You can find the full threads (assuming Kind Consumer does not have the sense to delete their posts) here and here. The humor of the suggested flavors is the highlight, but I think the summation appears in my comment (the penultimate one, not the snarky one that follows). Also it is worth noting that even as some commentators criticized Kind Consumer for launching an anti-THR campaign, they still threw in a bit of THR-vs-THR themselves. For the record, the evidence does not show that e-cigarettes are “safer than tobacco” — they are safer than smoking (by a lot). They are about the same as smokeless tobacco (and, as I have noted repeatedly, there is no evidence at all that allows comparisons among smoke-free products, though if I had to wager I would guess that e-cigarettes are a bit more hazardous than smokeless tobacco). Does the current generation of THR commentators really know so little about smokeless tobacco? Big tobacco may be scrambling to grab a hold of the e-cigarettes market, but there’s a little-known 700-year old tobacco product from Europe that’s also seen as having big potential. Snus (pronounced “snoose”) is similar to U.S.-style dipping tobacco. It’s a derivate of snuff with the history records showing its use dating back to the late 1400s. It’s placed inside the upper lip and is either sold loose in tins or in tiny tea bag-style pouches. Seen as having big potential compared to e-cigarettes? Even restricting to an inaccurate narrow definition of what snoose means, it has been reasonably popular and constantly discussed for decades, and still outsells e-cigarettes by a lot. Note to authors: just because you personally only recently learned about something does not mean that it is news. I trust I do not have to explain that “snus” is just the Swedish language word for snuff (aka dip, oral snuff, moist snuff), and so does not define a subcategory of smokeless tobacco, though it is also used as marketing term for ST products outside Sweden that the manufacturer wants to declare to be Swedish-style. The author’s failure to understand this results in the later statistics in the article being garbage: Swedish Match’s share of the U.S. “snus” market is fairly meaningless when you have no idea what the author thinks constitutes the market. I would guess it refers to all the products whose manufacturer happens to put “snus” on the label. But that is kind of like looking at someone’s market share for “protein bars” by looking only at products with that phrase in their labeling, ignoring all the various “energy bars”, “nutrition bars”, etc. that are the same category. The saving grace of the article, for me anyway, was the snarky first sentence. I can imagine that Swedish Match and the other ST manufacturers who are not in the cigarette business get pretty annoyed at the rhetoric coming from some e-cigarette advocates that suggests e-cigarettes are better than ST because ST is part of “big evil tobacco” while e-cigarettes are independent. So you can hardly blame them for sniping back. What many e-cigarette advocates do not seem to realize is that ST (in Sweden, the USA, and elsewhere) was popular long before cigarettes and until fairly recently was dominated by manufacturers who were not in the cigarette business, though that changed with acquisitions and expansions of cigarette brands into smokeless. (Sound familiar?) While I am not going to go look up the numbers, it may already be that a larger portion of e-cigarettes sales than ST sales come from companies that also make cigarettes (and if not, it will probably be the case in a year). My attention was called to that CNBC article by an e-cigarette blogger posting a note asking if anyone had written about snus before. Really. I am not trying to give this individual a hard time, because s/he is merely one example of a remarkable ignorance among the e-cigarette literati about where THR came from and why we can be confident it really works (and I want to make sure that individual gets credit for learning about it and writing something, though for obvious reasons I am pretty sure s/he does not read this blog and so will never see that). Less forgivable still are supposed scientific experts who have embraced e-cigarette based THR without ever repenting for — or even correcting — their history of lies about ST. The worst — but by no means only — of these is NJOY’s Richard Carmona, whose lies about ST when he was Surgeon General of the United States may have killed more people than any other single anti-THR liar. He gets paid to tout e-cigarettes now, without ever having corrected or showed remorse for those lies. All current THR products are great for public health, but no current product is a public health miracle. ST proved that THR works, both in terms of reducing the health risks and having a large impact in at least one population. E-cigarettes have proved that there was pent-up demand for THR in other populations, and that new products could serve some of that demand. But despite optimism from a year or two ago, it seems unlikely that the current version of e-cigarettes will make a much greater a dent in smoking than ST does. Sure, if the market were frozen now, both would continue to replace smoking and provide more public health benefits than the tobacco control industry could dream of providing. But new products are needed — and fortunately are in development. Each new low-risk product should be embraced for what it is (and understood for what it is not — e.g., if it is not quite as low risk as ST). Inevitably, some companies and going to try to market their THR products at the expense of other THR products (and I am not just talking about pharma), and some bloggers are going to focus on the product aficionado niche. But these represent a lack of genuine support for THR itself, and potentially harm the cause. What’s say we all try to push back against this THR-vs-THR balkanization.